Whereas some titles are better the more developed they are, that doesn’t automatically mean simple games aren’t good. And just like I came to realize after playing a game with one of the most simple setting I have ever seen, just because a game doesn’t have a storyline worthy of a light novel adaptation, doesn’t mean it won’t be an extremely pleasant experience. A Walk in the Dark is an Indie game by Flying Turtle Software that has been present for a while in steam’s Greenlight page. However, at least until it gets enough votes to reach the store, you can get it from its official site for 5€. The soundtrack is also available. The (short) story begins with little Arielle and her cat Bast happily together in the forest when BAM, an evil looking wizardry creature just flies by and kidnaps Arielle, enveloping the forest with a dark aura. Suddenly, the green forest is turned into a never-ending corridor of obstacles that Bast must overcome in order to save his owner. Simple, no? So, after the short animation sequence depicting the events described above, we begin the first stage. Needless to say, we control a slender black cat (pretty much everything in this game is black except for the backgrounds) and our objective is to take him to a pillar of light representing the end of the stage, without allowing him to be hurt (no life bar here, if something bad touches you OR if you touch IT, you instantly dissolve into a smoke cloud and are put back at the beginning of the stage). At first there aren’t really any threats to the cat’s integrity except for some spikes here and there, but as you progress through the one hundred stages, things get tricky. 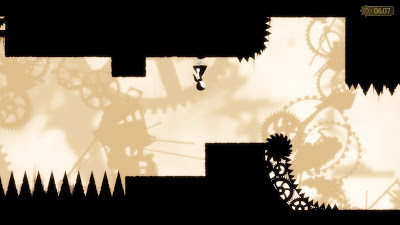 Levels get longer and/or more confusing with gravity -changing devices, rotating blades, less safe ground and an increasingly smaller margin for jumping errors. Make it into the light and you get a super simple “stage clear” screen, with your time, your best time and the PAR time. The PAR time is predetermined for all levels, and if you manage to beat it you are awarded with a Speedy badge. This proves to be a simple but extremely effective way to make you want to perfect each level, extending the game’s length. There is also an additional Shiny Badge, awarded if you manage to collect a shiny bauble found in every level, most of them in very tricky spots (just floating above some spikes or similar, making a perfectly executed jump mandatory). Of course you don’t need to get both badges on the same run, in fact you don’t need to get them at all, they’re just “Achievements” of sorts. 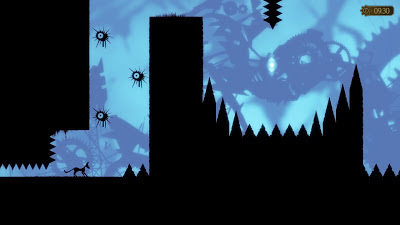 Not all levels are the same, some levels title “The Cave” have the cat run forward automatically, leaving you the challenge of jumping or ducking at the right time to avoid death. In my opinion these are the hardest stages. Since here the cat runs by itself, instead of par time you get a “First Run” should you successfully complete the stage on your first try. Seems a bit buggy though, if you fail your first try, you have to quit the level, load another one and then re-enter the original level in an attempt to do it “on the first try”. And it still doesn’t unlock sometimes. There are also Arielle’s stages, which follow the same mechanics as Bast’s, except here you move around and press the jump button to invert your gravity as you go over/under obstacles towards the end of each stage. This mechanic is also present in the cat’s stages but it’s only activated by stepping on certain light panels. All in all, a pretty challenging experience with a decent length (took me 6 hours to finish it with all the badges) and with a well-balanced difficulty increase over the stages. Control-wise it doesn’t get easier than this: analog stick to move, a button to jump and one to duck (as Bast). Arielle doesn’t even have the ducking button so you just move and press the jump button to change gravity, pretty much like in VVVVVV. Some stages might look near-impossible at first but as you repeat each section again and again you will start to mechanize your button presses, eventually perfecting every jump and timing. The last level especially, takes a while to master. 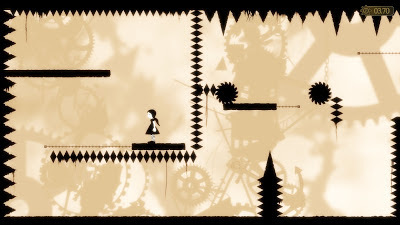 As I see it, A Walk in the Dark is a pleasant and challenging experience that all platforming lovers will enjoy, and the short but brilliant soundtrack fits in perfectly with the game’s setting. Also, did I mention it’s only 5€?